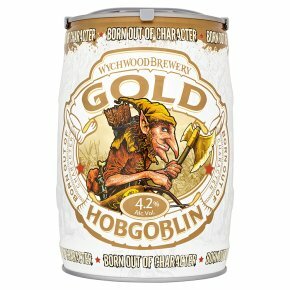 The golden sibling to Hobgoblin is ideal as a summer ale. It may be lighter in colour but it's definitely no lightweight. A combination of hop varieties and an infusion of wheat and malted barley has resulted in a golden beer with a huge hop punch, plus fragrant citrus and wild forest gooseberry flavours. Born out of character.A golden treasure hidden within the Wych Wood has been unearthed... & it's no fool's gold. The combination of four hop varieties & an infusion of Wheat & malted Barley results in a perfectly balanced golden beer - with a huge hop punch. Well what would you expect? The ideal serving temperature of your Hobgoblin Gold is between 8°C & 12°C, the temperature of the perfect pub cellar.